In 1954, psychologists James Olds and Peter Milner, of McGill University in Canada, conducted a breakthrough experiment exploring the brain and its physical reward centers. To do so, the duo drilled small holes into the skulls of rats so as to permanently implant bipolar-needle electrodes in certain regions of the brain. Once an electrode was inserted, it was “fastened to the skull with jeweler’s screws,” and allowed to heal before proceeding with the testing. (For those concerned, the researchers performed this operation humanely and found no evidence to suggest that the experiment caused any undue pain to the lab animals) The next phase of the experiment involved training the rat to associate electrical stimulation with depressing a lever. Depending on the region of the brain into which the electrode was implanted, Olds and Milner witnessed the full behavioral spectrum, from scenarios in which the animals do everything possible to avoid stimulation, to cases where the rats would forego food or rest chasing a dopamine high, pressing the lever at a rate of 1920 times an hour until they dropped dead from exhaustion. The study became an instant hallmark, or in the more measured words of its scientists, the experiment “[layed] a methodological foundation for a physiological study of the mechanisms of reward.” But to appreciate how this talk of rats and electricity relates to building and destroying lots in “Sunrise Valley” or its South Park-esque environs, we must first turn to PlayWay S.A., the publisher of Demolish & Build Company 2017 (herein referred to as “D&B Co.). PlayWay S.A. was founded 5 years ago by Krzysztof Kostowski. “S.A.” is short for the Polish “Spółka Akcyjna,” which you may more readily recognize in French, as “Société Anonyme.” Plainly, it is a business suffix roughly analogous to “LLC”. Later, I shall explain why I have belabored this point, but for now keep it on the backburner along with Olds and Milner. In its own words, PlayWay has a “unique concept” when it comes to video game publishing – though Infinity Ward might disagree. “[Our] objective [is] to diversify and minimize risk,” Kostowski states, “by creating a large number of games, using many different teams, located across various cities in Poland.” Yet, it seems upon browsing PlayWay’s library that they mean ‘diversify’ in the quantitative, and not qualitative, sense. That is, their releases smack of a certain sense of homogeneity. This may be related to PlayWay’s monopoly on game development in Poland – they are the only game developer in the country. By and large, their releases are simulators built on the same engine, using the same textures, and providing roughly the same experience. Perhaps their most well-received title, with “Very Positive” reviews, is Car Mechanic Simulator 2015 (and its thousands of add-ons). But in recent years, the reception has mellowed out. Robot Squad Simulator 2017, released concurrently with D&B Co., has had a quiet and tepid reception. in the words of ThroneX, a gamer whose credentials stem mostly from the fact that he owns 1371 games on Steam, “The game is decent. Not good, not bad.” Farm Expert 2017, (which I presume omits “simulator” from the title for the sake of Kostowski’s ‘diversity’) released a month earlier, was widely panned by critics. The gamer revalation sums up with insouciance: “[I] cannot actually do anything worth doing in the game.” And I am skeptical whether PlayWay will return to correct the bugs in Farm Expert, as their business model is about pushing things out the door, and they mean it: PlayWay is currently developing 61 games. They are not interested even in playing their own games, logging in a whopping 2.1 hours of playtime since 2015. Steamspy reports that the 16 games released by PlayWay boast an average rating (userscore & metascore) of D- (62%). That seems about right. Details about Noble are thin, which is neither helped by their quiet but opinionated twitter, nor by their sparse and random collection of videos, some of which are simply unviewable as they were uploaded behind a private firewall. But what we can research is quite telling, namely, that D&B Co. was essentially programmed and released 2 years earlier under the title, you guessed it, “Construction Machines Simulator 2016” (released in 2015, naturally). But you would never know, since Noble’s Steam page lays no claim to the piece, in contrast to their website which reads quite simply, “This game is our first physical release.” There exists a queer difference between the philosophies of Noble and PlayWay: unlike the cookie-cutter approach of PlayWay, Noble possesses a craftsman-like, artisanal approach to development. This is evidenced by the sheer detail that went into the discontinued Noble Reader/Text tool. What could have other been a basic reading widget has been refined (or overkilled) into a robust in-game literature device. I’m calling it now: if Noble Muffins can hunker down and pump out a solid piece of their own making, the gaming community will be all the better for it. Just looking at their deceptively simple “Gamma Knife” makes me want to play it, to experience it. It is an abstract, technical-skill game where you “use your double death ray to defend your city from a hailstorm of nuclear bombs.” Hell, who doesn’t want to play that? B&D Co. described in one word: convenient; in two words: Too convenient. You play as Superman, because you can walk up to re-bar concrete pillars and topple them with a few swings of your sledge hammer. What happens when the wall collapses and you find yourself underneath? Nothing. Well, that’s convenient, you think. I can just keep smashing stuff. Besides, it would be annoying to have to actually move out of the way. What about when you’re stuck and not sure what to do? Deploy your Spidey Sense, er, I mean Worker Sense. WeBeAre, the YouTube game reviewer with over half a million subscribers, or as Noble Muffins calls him, “this guy,” agrees with my sentiment. “I really do like that worker sense though,” WeBeAre cheerfully opines, “it makes it a lot easier to be like, ‘Ah! That’s what I want to do!” Again, convenient; why should you have to waste time figuring out what to smash or pick up (the actions you will overwhelmingly perform throughout the game)? Fear not – the convenience doesn’t stop there. Need to get between two places? Just open up the map, boilerplated to oblivion, and click on the location. You’ll take a taxi – as if they would even exist in this town – right away, and for free to boot! The catch is, you have to have visited the location first, so you’ll have to drive on the roads, and avoid wrecking the cars of your fellow denizens. Or do you? Nope, turns out you don’t. Indeed, if you drive your fully-loaded freight truck head-first at top speed into a sedan, it doesn’t budge an inch. In fact, just like real life, all the momentum is completely transferred to your vehicle (/s). Just like the concrete walls, any hope of realism is smashed altogether when you hope to assign a worker to the task of delivering trash bags, only to discover that he’s not qualified. Not qualified to deliver trash bags? And on the subject of workers, as the owner of your construction company, you find yourself beholden to some random worker who gives you orders. Nothing would have been lost, and some realism points gained, were you simply cast as a foreman, or the like. 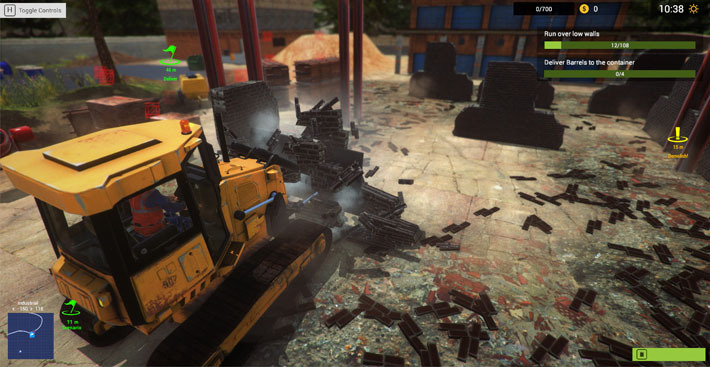 The Steam user Pyro, self-described as “someone who uses heavy equipment everyday” echoes my lamentations of the lack of authenticity, writing that by and large, the centerpiece of the title, i.e., construction, is wildly unrealistic. Alone, that would not be an issue, but the fantasy is pervasive. Combined with the taxis, mission starts, and travel between different parts of the town, you might more accurately call the game Loading Screen Simulator 2016. And so we return to Olds and Milner, and the société anonyme. D&B Co. is an air sandwich. It lives up to the PlayWay S.A. name in that it is anonymous, faceless. There is a stinging lack of purpose to it all, more so than what you would naturally expect going into a game about knocking down and putting-up walls. In striving to cut the fat out of the game, they removed most of the meat, too. Like the psychology experiment, you will find yourself pressing a button over and over again for momentary, meaningless entertainment. And like the experiment, it’s probably not in your best interest to feed your mind the mental equivalent of potato chips. Feel free to enjoy the game, and you may well, for the average 4.3 hours of playtime reported on Steamspy.